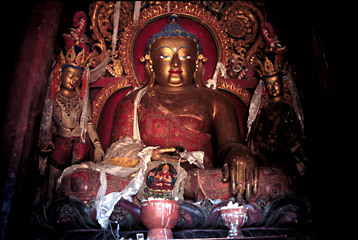 Although thousands, perhaps hundreds of thousands, of Buddha images have been lost in Tibet, thousands remain protected. Tourist income has encouraged the Chinese government to preserve or restore the most sacred spots. In Gyantse, this Buddha was one of 108 in a chambered chorten/temple.